Allahabad Bank Recruitment 2017 . 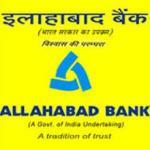 Allahabad Bank invites Online Applications for recruitment to the posts of 60 Specialist Officers. [50 Chartered Accountant /Financial Analyst in MMG Scale-II , 05 Security Officer in JMG Scale-I, 04 Civil Engineer in JMG Scale-I, 01 Electrical Engineer in JMG Scale-I ] .The employment details about the posts, age limit, educational qualification, experience and other conditions are given below as link. The candidates are requested to go through the details and ensure that they fulfill the minimum prescribed criteria before applying. Apply from 10-05-2016 to 30-05-2016. Application fee: Rs 100 for ST/SC/PWD and RS 600 for all other through online payment mode. How to Apply: Interested Eligible Candidate apply online through www.allahabadbank.in from 10-05-2016 to 30-05-2016. Age Limit : age limit should be 18-26 for open & 18-29 for OBC candidates as on 11-12-2015. How to Apply: Eligible candidates may send their application along with relevant certificates on or before 21-12-2015. Allahabad Bank Recruitment 2015 . Allahabad Bank invites Application for the post of 12 Manager IT & Senior Manager (Credit) in MMG Scale-III] through Special Drive for filling up of backlog vacancies reserved for SC/ST/OBC. Allahabad Bank is a nationalised bank with its headquarters in Kolkata, India. It is the oldest joint stock bank in India. On 24 April 2014, the bank entered into its 150th year of establishment. It was founded in Allahabad in 1865. The employment details about the posts, age limit, educational qualification, experience and other conditions are given below as link. The candidates are requested to go through the details and ensure that they fulfill the minimum prescribed criteria before applying. Apply Online before 09 July 2015. For Manager IT : 4 year Engineering Degree in Computer Science/Computer Applications/ Information Technology/ Electronics/Electronics & Telecommunications/ Electronics & Communication/ Electronics& Instrumentation. OR Post Graduate Degree in Electronics/ Electronics & Telecommunications/Electronics & Communication/Electronics & Instrumentation/ Computer Science/ Information Technology/Computer Applications. OR Graduate having passed DOEACC ‘B’ level. For Senior Manager (Credit) : CA/ICWA/MBA (Finance)/MMS (Finance)/ MFC (Finance) from a recognized University/Institution with recognition from AICTE with basic knowledge of computer operation. Selection process : Selection will be made on the basis of Online test/Group Discussion and Interview or only Interview. How to Apply : Interested candidates may apply Online through the website www.allahabadbank.in from 10.06.2015 to 09.07.2015.